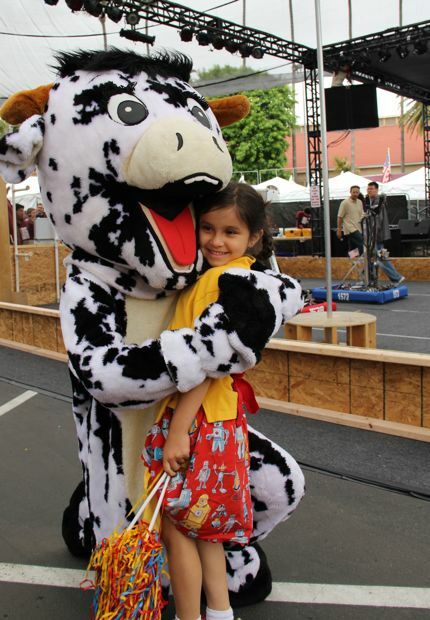 Chicken Blog: San Diego County Fair Student Showcase :: Passion FIRST! 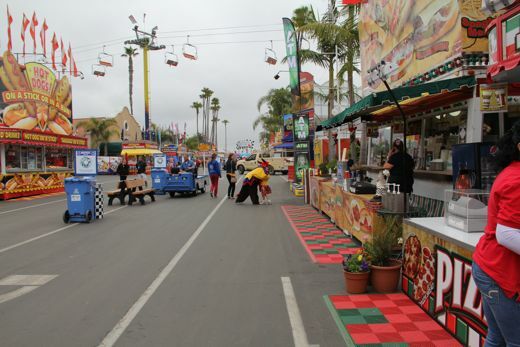 San Diego County Fair Student Showcase :: Passion FIRST! Ah, the power and passion of Paradox. 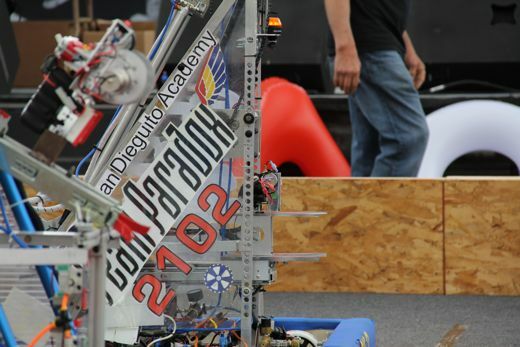 FIRST 2102 Team Paradox Passion! 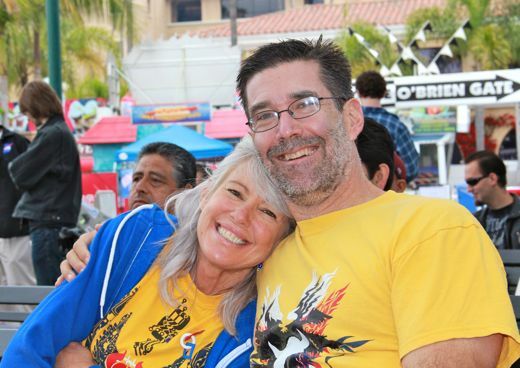 It's so powerful it got us up and out of the house to visit the Fair, where we got to enjoy a mini competition demonstration of the awesomeness of FIRST and Team San Diego. 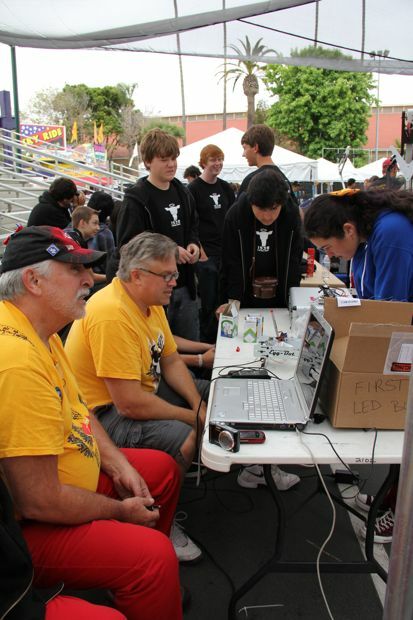 FIRST 2102 Team Paradox earned a third place ribbon, exhibiting Terence and the mini-bot tower. Not to be apologetic, or defensive, but I gotta say: I am partial to robots built by students, a little rough, kind of scrappy. Terence is a robot built of team passion and sweat equity, and he looks FIRST rate to me. Hello, CLU. 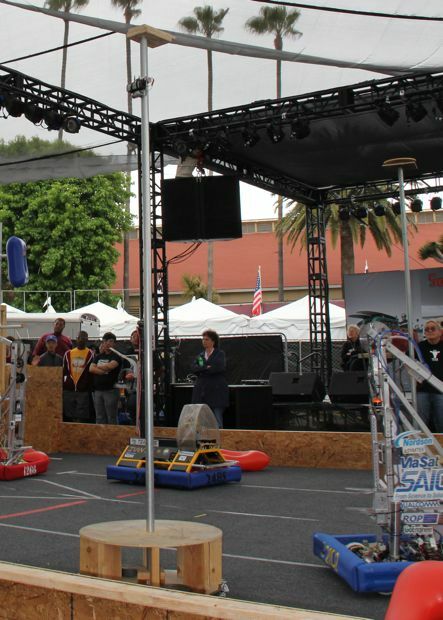 The mini-bots, CLU and Rinzler were being showcased too, and they enjoyed coming out for some tower races. 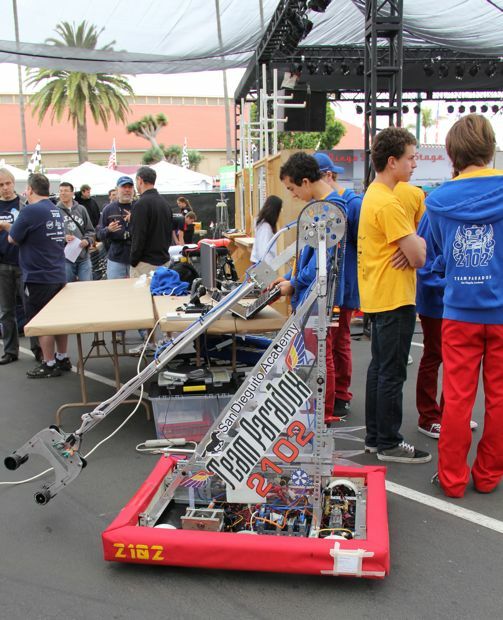 FIRST 2102 Team Paradox brought the spec-accurate mini bot tower, so teams could test and time their mini-bots. After all those regional competitions, and Championships, it was fun to bring back LogoMotion, to hang out with friends and enjoy the robots. Here is the mini-bot of FIRST 2485 Francis Parker's We Are Robot Lords... aka WAR Lords. Loading CLU, making systems checks... the team gets set for another match of LogoMotion. 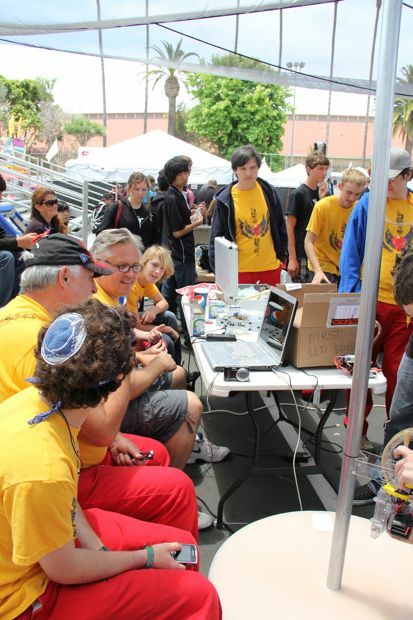 FIRST 1622 Team Spyder, 2009 Las Vegas Regional winners. 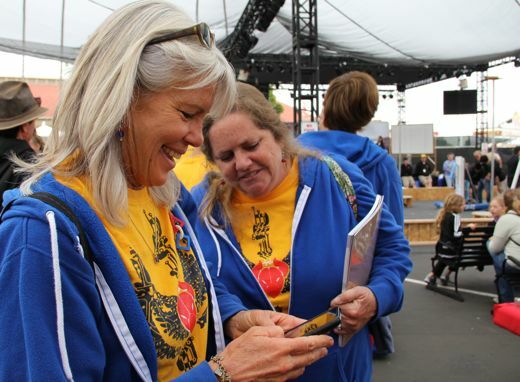 Team San Diego is full of winning teams! And here's the Spyder Mini-Bot set to climb the tower. There is always something to update, maintain, adjust... mechanically, electronically, with the programming, in business and outreach. 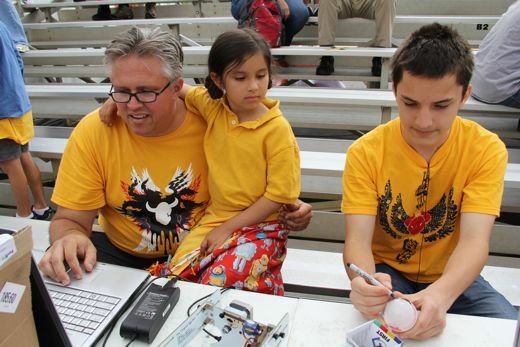 Passion for FIRST and robotics doesn't stop after the buzzer. 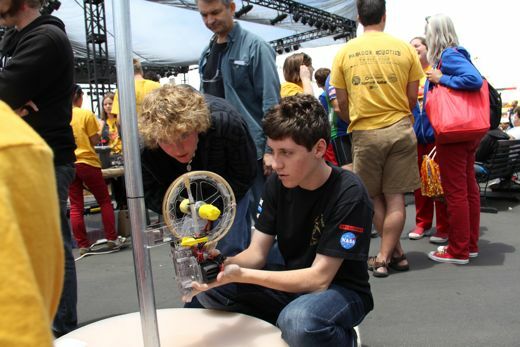 Even with the 2010-2011 season just wrapped up, FIRST 2102 Team Paradox is already launched into the new season with great summer projects, like park clean-ups, and sponsor connections, like visiting SAIC... an exceptional experience for the team. 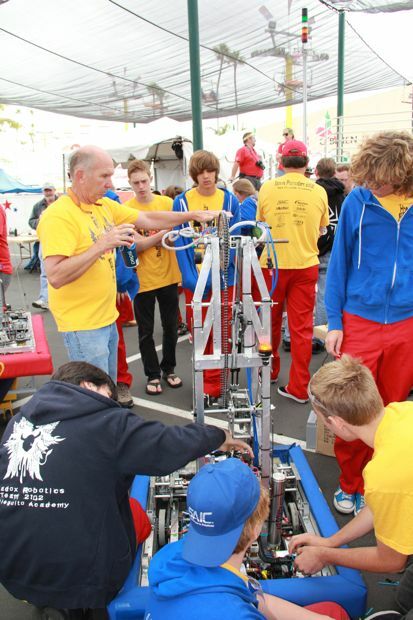 New opportunities have come up too, like mentoring FTC rookie team the Lancers from Carlsbad High School. The metal shop isn't taking a break, and the prototype for FIRST 2102 Team Paradox's T-shirt cannon is looking real good! 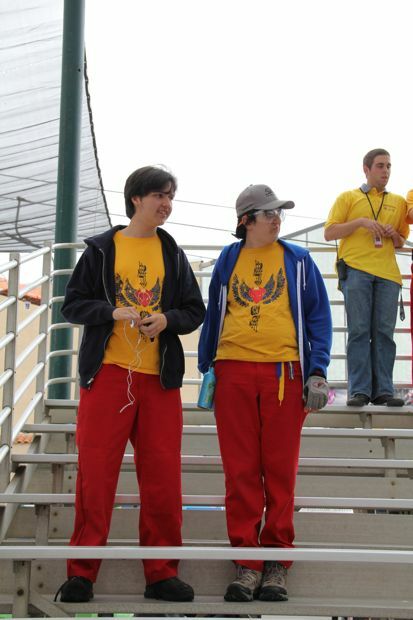 and not just for FIRST 2102 Team Paradox... as younger teams, like FIRST 3128 The Aluminum Narwhals, and seasoned teams, like FIRST 812 The Midnight Mechanics, work together to share the message of FIRST, to support Team San Diego teams... opportunities to celebrate and learn, to grow as a powerhouse of robotics passion... all FIRST robotics participants benefit... from FLL Juniors to FLL to FTC and right through FRC. 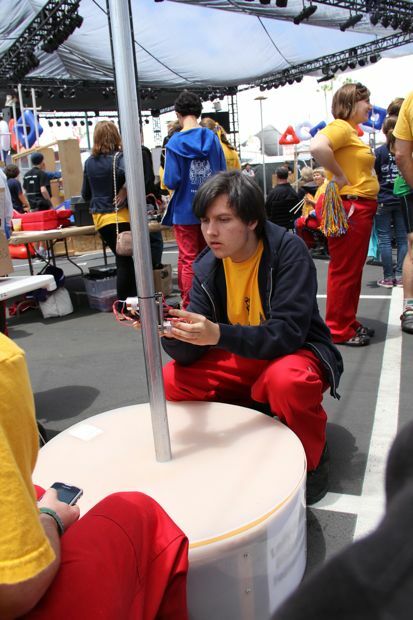 Even mentors, and sponsors feel the benefits and joys of hardworking and bright Team San Diego member teams! Remember Maria's EggBot, the one she built with her dad? 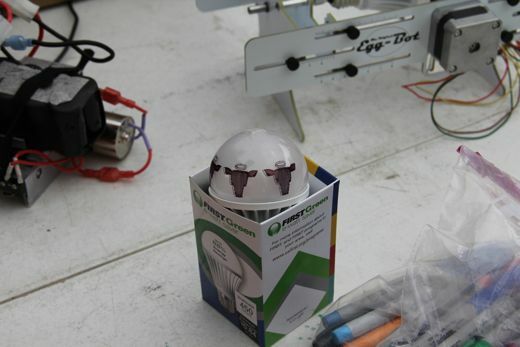 It was a huge hit when FIRST 2102 Team Paradox shared it at the Street Fair, so we brought it to the San Diego County Fair, and this time, instead of drawing on eggs, Geoff set it up to add team logos to LED light bulbs. Want to do your energy bill a world of good? Want to do the environment a world of good? Purchase our 7-watt/450 lumen LED light bulb that replaces up to a conventional 60-watt household light bulb – it is a high-performance bulb that features longer life and significantly lower energy consumption than traditional bulbs. 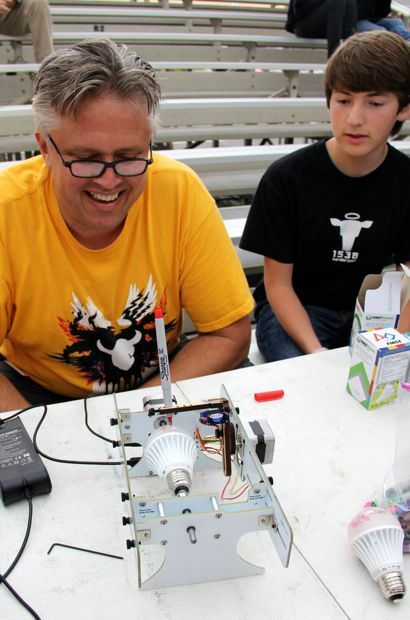 The EggBot added colorful team logos and mascots to the bulbs... very cool. Holy Cow, it's fun to watch too! Fair ladies, at the Fair. 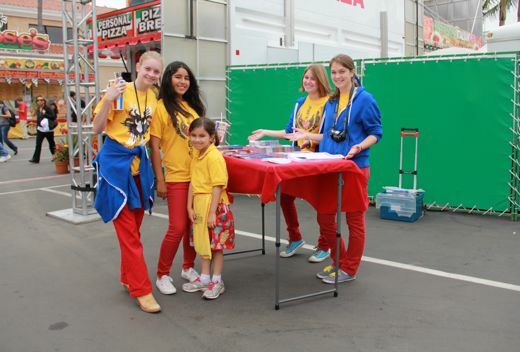 When it comes to outreach, marketing, budget, and FIRST passion, these girls are all business! 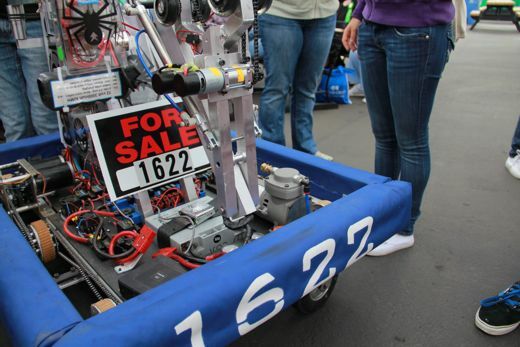 The business of robotics is an idea worth spreading wherever we go. 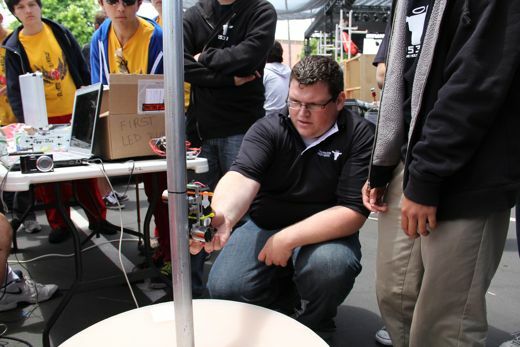 Terence scored some points hanging inner tubes, then moved to the tower to deploy the mini-bot, CLU. 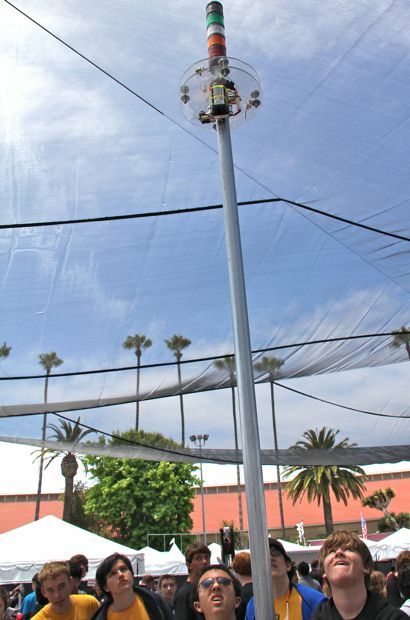 The deployment arm is out and at the pole, and CLU is beginning its ascent. These mini-bots are fast, and CLU is tops. Today the mini-bot was making it to the top in under two seconds. The record time for CLU climbing the eight feet is .9 of a second! Here comes the mini-bot for FIRST 1538, The Holy Cows. 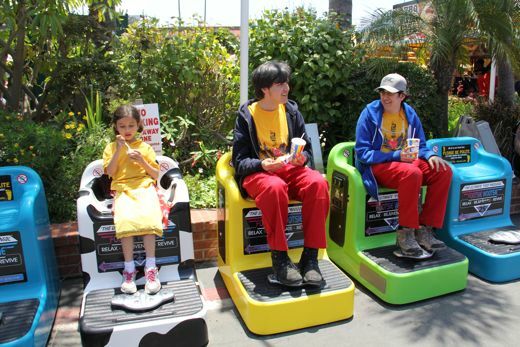 They won the Silicon Valley FRC... GO Cows! 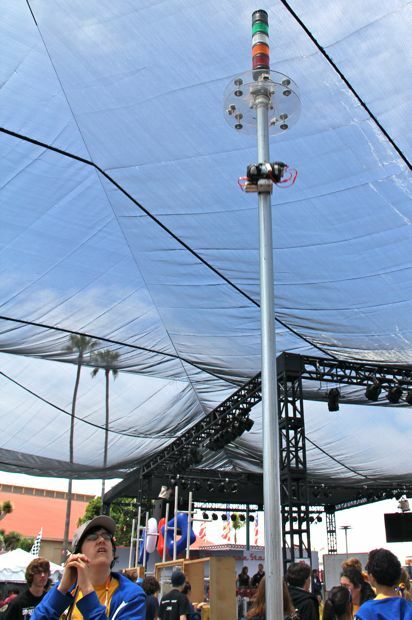 The tower is wired to the computer, which starts the timer and activates the lights at the top of the tower. When the bell rings they release the mini-bot. CLU is ready to go. 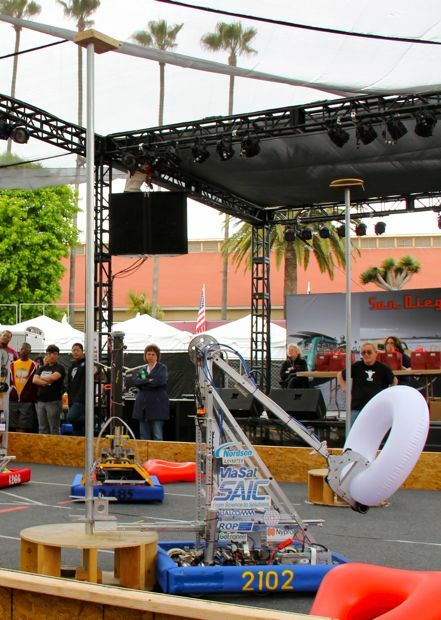 Mini-Bot time: eight feet in 1:61 seconds! That's the fastest mini-bot of the day! w00ts! Maria came with her Paradox eggs, chocolate eggs. 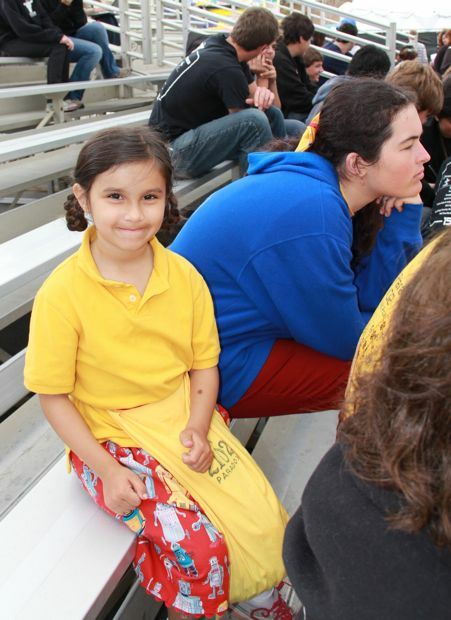 Maria came with her Paradox spirit, Team San Diego spirit! 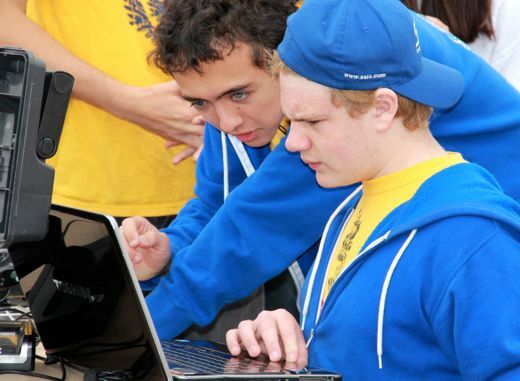 Robotics all year. When you are talking about friends and learning, about good times... it just makes sense to keep the good times moving forward. 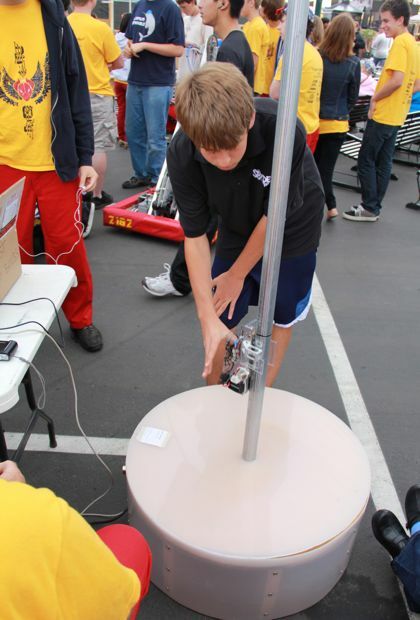 Sixth grader Jackson, from Scripps Ranch, could not wait to see the student showcase, the FIRST robots, and he especially wanted to learn more about those mini-bots. 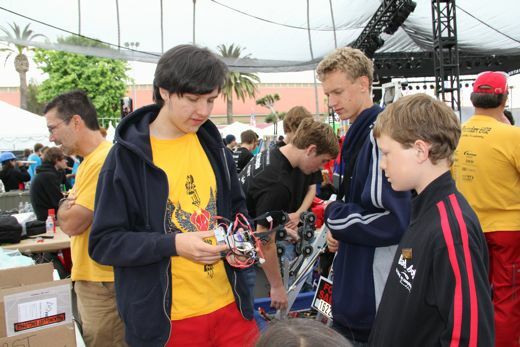 He says he wants to find an FLL team and join the fun. FIRST, Team Paradox, the people who come together to learn and play... it is gratifying, it gives hope, it affirms beliefs. It brings a smile to your face. It's really kind of super awesome that you are seventeen, this is an incredible time, you are doing the things you are passionate about, have dreamed of... keep on dreaming, keep on believing! I hope you are enjoying life, as much as we are enjoying watching you grow and learn, play and explore! You are a dream coming true. I can not begin to tell you how cool this is and how much it all amazes me, Natalie. The things these kids are doing just incredible. I know you know because they amaze you too. I am so thankful that you share this with us. It gives me great optimism about the next generation. Oh, how very, very wonderful. 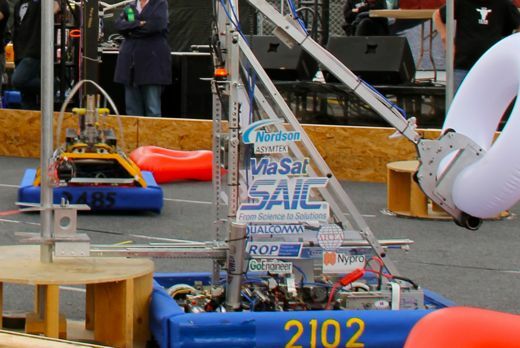 It looks like a fantastic time, and it's so great to see that there are enough teams in your area to have a FIRST competition of your own! 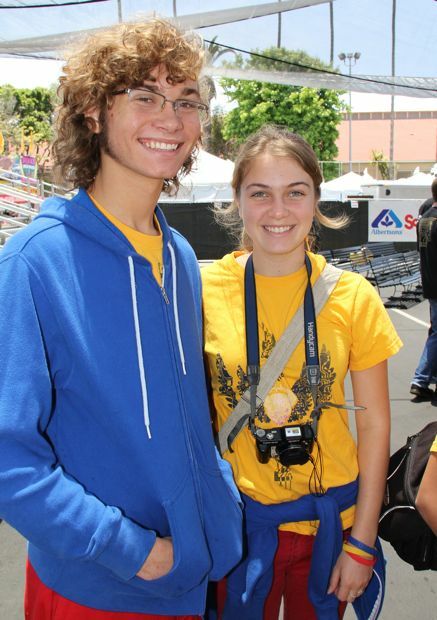 I love the EggBot, and I love the robotics passion you're spreading so amazingly well. Your family has the most incredible adventures. It's all quite mind-blowing. I'd love to watch those mini-bots whizzing up the tower. 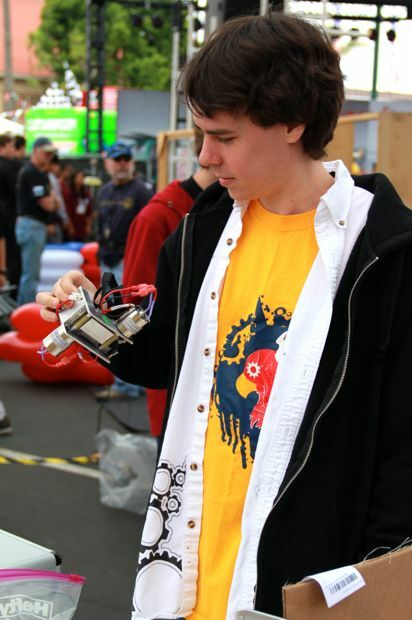 We are so lucky that you are impartial to all the robot stuff, and only take the required number of photographs of the action. I guess we missed another great day, and I totally missed Alex's birthday, from what I could see he seems to have been very happy. What a fabulous day, and so much incredible energy! Happy Birthday, Alex -- because it's never too late to have a happy birthday!! I love all the expressions you've captured -- from concentration to glee to bemusement to pride. And our lives in a home with a view. COPYRIGHT: 2002-2019 by Chickenblog and its family members. All rights reserved. Please do not use our original photos, or drawings, or reprint our writing without obtaining my permission. Thank you! When a comments field does not appear, just hit "refresh." Would You Like To Email Us? Maria, writing a card to Charlotte: How do you write "chuther?" Maria, urgently: Pick a number between one and ten. Maria, thoughtfully: Hmm. That's a good number. Walking Maria to school: Have a wonderful day, Maria. Oh, mama! Every day is wonderful! On the drive to Eagle River, Wisconsin, Maria suddenly exclaimed: Woo! I am screaming for nature! Maria punctuates with Expiration Marks. !!! !<---expiring from exclaiming with excitement!!!! My mom is the greatest because: She peks up chrash. I've been working on a new blog post for about a week, but the closer I got to this date, the slower and more distracted I became. Today is the first of 2 different hearings, related to the accident. I've been anxious. But now... now, I am sick with it. I feel as trapped and vulnerable as that night, stuck in my crushed van. I don't want to see her. I don't want to be seen. I wish I knew how to do make-up, feel confident, look composed. Is there even a lipstick or cardigan that could help me? My concerns, what I am sharing, seem so trivial, but of course there is more... it's just that even on a superficial level, I feel barely capable of coping. How, or when, I will ever feel ok, again, is beyond me. Thank you for comments. Comments and engagement make blogging worthwhile. Also, I wish I could prescribe wonderful smelling ointment and a good shoulder massage to everyone in the world. Now I am going outside to look at birds. Nope. Thats a negative. Computer and Phone are not cooperating, and nothing is importing. I am like a balloon with a very very teeny leak, slowly deflating, with a high pitched whine, into a flabby little puddle. Perhaps it's a good time to open my gratitude journal and stretch myself into a better state of mind, or do the plumbing. Errrm... maybe not. It's been 9 minutes, and only 4 photos have imported. And nothing is whirring or spinning, or counting down. Also, I came downstairs to find all of the stuff from under the kitchen sink out of place, and paper towels lining the floor of the cabinet. Leak. Mystery leak. It's not plumber time, yet, because I am handy-enough to at least make a diagnosis, if not the repair. But, for some reason I am not in the mood to crawl into the cabinet, with the water running, and figure it out. I will. Just... let me work up some enthusiasm for the task, first. Ugh... still only 4 pictures imported and it's been a quarter of an hour. oh! Hello! Good news... I've tried half a dozen times to get the computer and phone to talk to each other, to no avail. This morning they seem to have called a truce, and I may be uploading photos! Finally. At last. W00T W00T! Alex and I had our school break last week, and Max is taking his spring break this week. Maria's break doesn't come until April, but it won't include Easter. Geoff may get time off, after months of long hours and working weekends, but he's not sure he should actually take the time off. I'm not surprised or even complaining... it's more of an observation and casual, "bummer." And then I wonder if I should be making plans for summer. A flock of cedar waxwings visited the bare tree just across the street from our house, and I got Geoff, Maria, Max, and Alex to come out and look at them. We could see them plainly, and with binoculars we could see the vivid red and yellow bars on their wings. It's been an amazing winter for birding, and I've delved into it even more than the year of the scissor tailed flycatcher. I've seen Grace's Warblers, Townsend Warblers, Hermit Warblers, Audubon Warblers, Mountain Chickadees, Cassin's Kingbirds, House Finches, Pipits, Kinglets, Western Bluebirds, Mockingbirds, Red shouldered Hawks and Red Tailed hawks, California Towhee, Black Phoebes, Bushtits, Comorants... gulls, doves, crows, and scrub jays, of course. Follow by Email and Stay Up to Date! "Sometimes you will never know the value of a moment until it becomes a memory." "Everything has a beginning, a middle, and a new beginning. And it is not the end, until we stop moving forward." "Happiness is not a finish line, and if we can't feel content amid the mess and the striving, we might never feel it." "To handle yourself, use your head. To handle others, use your heart." "Surround yourself with amazing and remarkable people - and you will live an amazing and remarkable life." "Show up fully, pay attention, tell the truth, let go of the outcome." 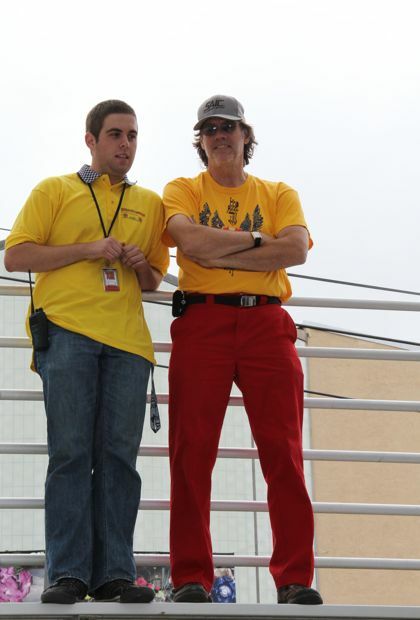 Some life~ blogging advise from a good friend. "The opposite of play is not work; it's depression."